Tube complement: 12SA7GT mixer/oscillator, 12SK7GT IF, 12SQ7GT detector, 50L6GT audio output, 35Z5GT rectifier. Approximately 9 inches / 228 mm wide. The ivory knobs are not original. All the other ivory Arkay S5E radios I've seen have black (or maybe dark brown) knobs, as did this radio when I bought it. 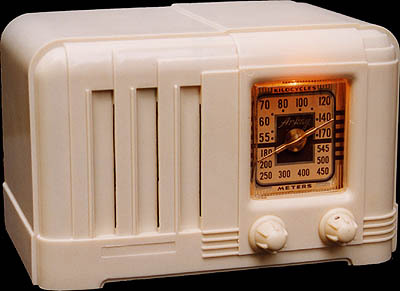 I swapped the black knobs out for ivory ones right away—I think the radio looks much better this way. I'm usually such a stickler for originality—I wonder what got into me? Scratched into the chassis, in two places, is the name "Geo. Travis." Scratched below the name is "Wed. nite." So I suppose George built this Arkay kit on a Wednesday evening, way back in the early 1950s. Unlike my circa-1960 brown Arkay below, this one contains no Japanese components. The tubes are all Tung-Sol brand (no doubt the originals), and the other parts are made in the U.S. and have an early 1950s look to them. Apparently George sold the radio at some point. Written on the cardboard back is the name Richard Miller. George and Richard should've been dissatisfied with the radio's performance. I was, and found that the oscillator and antenna sections of the tuning condenser were swapped. This mistake probably occurred when the kit was built. As a result, the dial calibration and tracking were off, and the sensitivity was poor. After swapping two wires and realigning, the set perked right up. This one was built by A. J. Kulat, who also inscribed his name on the chassis. It was found in unused condition, but fully assembled, in its original box. It hardly worked, but the only problem was that it had apparently never been aligned. I date this one to 1960 because the box says "Arkay International Inc. ... Winner of Fashion Foundation Gold Medal Award for Excellence of Styling 1958 ... with the Golden '60 Lifetime Guarantee." Also, the vacuum tubes are all labeled "Elevan Electronic Co. ... Made in Japan." The paper capacitors are from To-con (Tokyo Chemicon Co.), yet the resistors, filter capacitor and other parts appear of U.S. origin. Occasionally I see one of these Arkays for sale with a "rare" green dial (instead of the "common" gold dial, I presume). 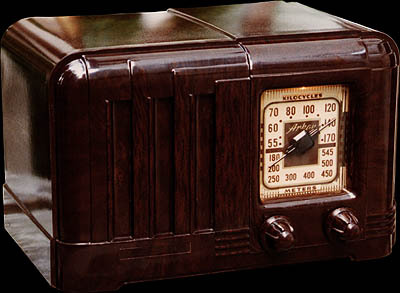 Years of rigorous research have revealed the source of these mysterious green-dial radios. The dial plate, as supplied in the kit, had a protective plastic overlay that was supposed to be peeled off after assembly. This plastic sheet has a green tint. If the kit builder failed to peel off the plastic—voilà!—a rare green-dial Arkay! Now, if any of you collectors out there have the green-dial version, you know what you've gotta do.